We're still waiting for a phone call from our smog referee to let us know if our Locost qualifies for a permanent smog exemption under SB100. We don't expect to be turned down flat, but we could be brought in for further questioning, for a couple of reasons. First, we had a lot more receipts than the referee actually copied, and if anyone sat down and looked at the materials reported on the receipts he copied, it wouldn't add up to nearly enough metal to build a whole car. So there's that. 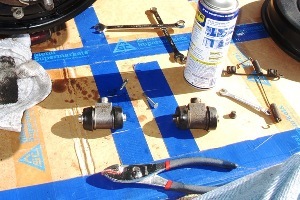 The other concern is the PCV valve. 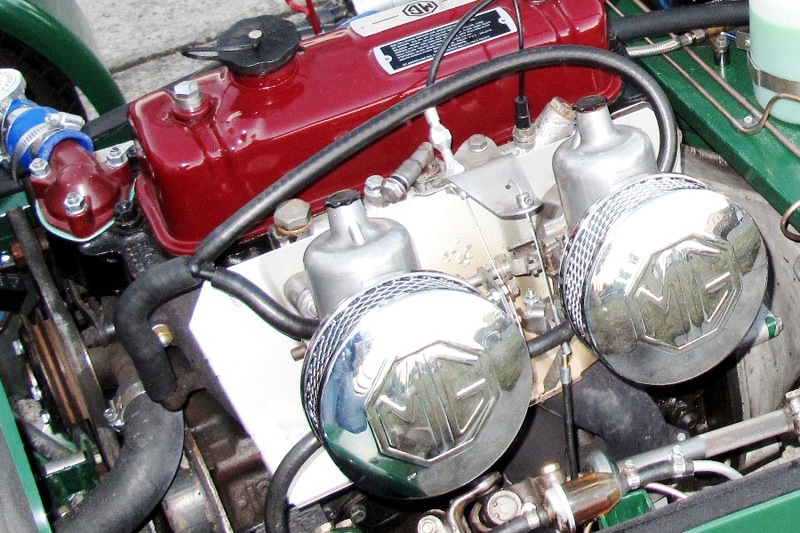 The referee noted that all exempt cars still need a PCV valve for crankcase emissions. 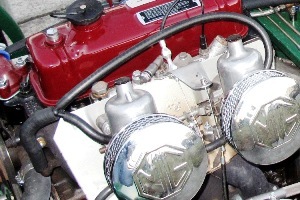 The problem is, 1972 MGBs didn't have PCV valves. 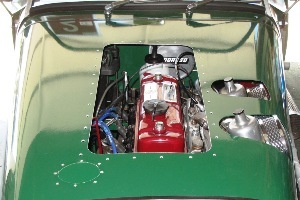 Ventilation was handled by sucking the crankcase fumes into the carburetors. Looking over our engine in the parking lot, we pointed out all of the various hoses that perform this task to the referee, and he seemed satisfied, but the thing is, it's not up to him. He has to convince Sacramento that we're on the level. So we won't know until we get the call, but in the meantime we can still schedule our brake and light inspection. 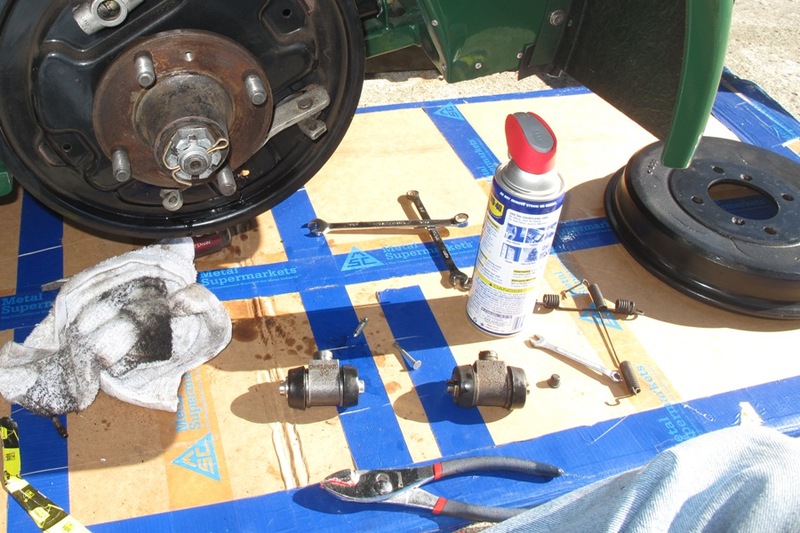 First, however, we had to fix the brakes. 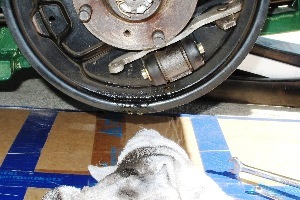 A routine check of chassis welds last week uncovered telltale radial fluid lines on the inside of the right rear tire, and a fat drop of DOT 4 brake fluid hanging off the backing plate. As some of you might recall, the right rear wheel cylinder on the donor car was frozen solid when we first acquired the car. We managed to free it up and get the cylinder working, but we were never sure about its ultimate longevity. Now we are. It's done. This also explains, at least in part, the need to top off the master cylinder every week or two. 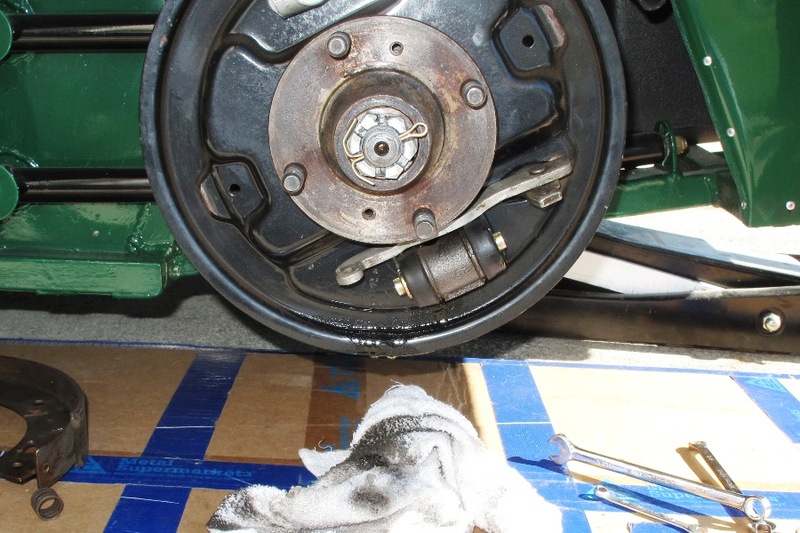 So we got a new Armstrong wheel cylinder from Moss Motors, and installed it yesterday with very few mishaps. We also cleaned up all signs of earlier leakage, and everything now appears to be totally leak-free. After tightening up all the fittings, we bled the brakes well enough that we can once again stop the car before the brake pedal goes completely to the floor, all of which gave us enough confidence to schedule our brake and light inspection for next week, at an authorized BAR station only a few minutes from the house. Bring it on. Meanwhile, in our ongoing efforts to keep the never-ending hood scoop project moving forward, we cut a big hole in the bonnet and riveted the fiberglass scoop in place. As with the rest of the body panels, we stuck some caulking between the scoop and hood as a sealant-slash-adhesive, and gummed up a few more clecoes in the bargain. Fortunately we're only using the clecoes we gummed up last time, so no additional damage, and we added a couple of dozen brand new clecoes from McMaster-Carr to the collection, so we may be ahead of the game. The riveted scoop looks like major progress, but we're still years away from completing the task, or at least several weeks, what with all of the putties, fillers, and thousands of coats of paint and primer that we'll need to apply in order to make the scoop look like part of the car. If that's even possible. 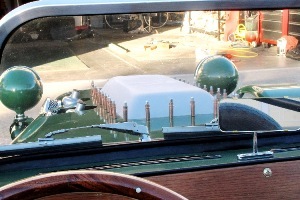 In the meantime our primary goal during this phase of the operation will be to keep the car on the road, even if that means driving around with the bonnet in a somewhat transitional state. And it actually doesn't look that bad. Not really. Except for the color. In any case we're reasonably satisfied with the results we've gotten so far, although we're not entirely sure that doing our own fiberglass work was such a hot idea. Not because we didn't do a decent job, although that's certainly a big part of it, but making anything out of fiberglass is a huge job. It takes forever, it's incredibly messy, and it costs too much. Scoops like the one we made go for around $200 at Summit Racing. We probably spent around $100 on resin, cloth, and fiberglass mat, which sounds like a bargain, except that's not all there is to it. Before we could even start on the scoop, we had to make a buck and a mold, and put a nice finish on each of them. The wood, varnish, paint, mixing cups, release wax, and putty weren't free, and our sandpaper bill had to be over $500. So we saved very little if anything by doing it ourselves. 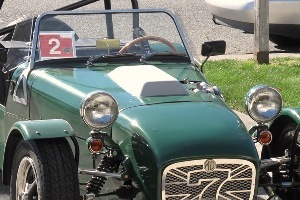 But even if we found a pre-fab scoop as perfectly sized and proportioned as the one we made, for a reasonable price, we'd still have to fit it to the hood. So from here on out we have only ourselves to blame if it all goes completely wrong. Great site that I stumbled upon. I see you have used some photos of my 7 on your site. That is cool and OK with me. 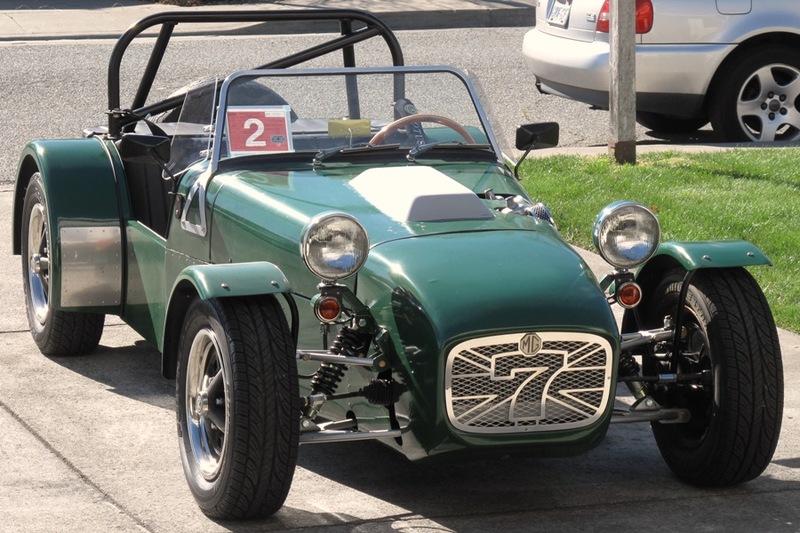 Good to read that you are getting to the stage of having a street legal clone 7. Martin, it's an honor to have you here. 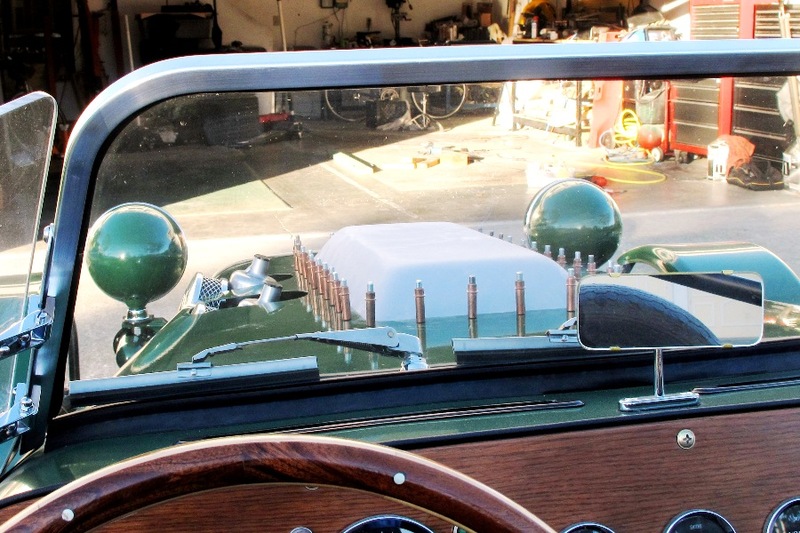 You are no doubt well aware that your MGB Locost was one of the things that kept us going for the past two and a half years. Your car and the photographs you posted on your build were a real inspiration, and we just hope our Locost measures up.